Go back to the main Flight Navigation Page. Before boarding an aircraft, a navigator must thoroughly plan the flight. A well-planned flight provides a professional atmosphere, enhancing safety and accomplishment of flight objectives. Also, adequate flight planning prior to flight can avoid unnecessary in-flight problems. This category describes the navigator’s flight planning. It begins with a discussion of air traffic control (ATC) systems, followed by a brief description of publications, with which a professional navigator should be familiar. All phases of ground planning are discussed, from chart selection to arrival study. Rotating Flight Navigation Plotter – Rotating azimuth eases flight planning with direct course readout. 8 scales to meet the needs of all VFR aeronautical charts; nautical on one side, statute on the flip. Nautical-statute conversion scale also included. 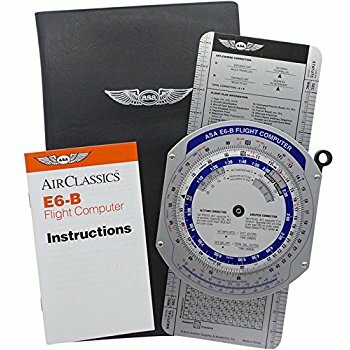 Slide-Rule-Style E6B Flight Computer. On the circular side, black is used for the rate arrow and units to be calculated; Red is used for weight and volume; Blue is used for distance, time and temperature scales. On the wind side, colors are used to identify wind variation: blue identifies west (or right wind correction angle) and red identifies east (or left wind correction angle). ASA’s color E6-B is made with solid aluminum construction and features the functionality pilots have relied on for decades. U. S. Air Almanac 2018 – The Air Almanac 2018 contains the astronomical data required for air celestial navigation, making it a necessary resource for all pilots and others attempting to chart routes based on celestial bodies. The Almanac also provides the Greenwich hour angle and declination of the Sun, Moon, and three navigational planets along with the Greenwich hour angle of Aries, all tabulated at 10-minute intervals. Davis Instruments Sextant – Used for measuring the angular distances between objects and especially for taking altitudes in navigation. Sight Reduction Tables For Air Navigation Pub. No. 249 – Vol 1. – These tables were designed for air navigation where weight and space are at a premium, however, they are very popular with sailors too due to the fact that Vol. 1 offers a speedier way to compute stars. Volumes two and three may also be helpful.